Onyx Solar recently teamed up with Butech to launch a new line of photovoltaic paving stones made from ceramic and glass. The streamlined solar stones are manufactured using a process that produces less CO2 and uses less energy than traditional pavement, making this energy-generating material even better for reducing the environmental impact of building projects. Onyx and Butech hope to release the tiles to market by the end of this year, making them the first PV pavement system available for purchase. Though the pavement is not suited for vehicular traffic — unlike the Solar Roadway — it is well suited for human traffic and can support furniture as well, in case you’d like your back patio to power your home. The tiles are made of ceramic and glass, and though Butech and Onyx seem to be confident in their ability to sustain wear and tear, we’re a little worried about how tough they are. Onyx Solar and Butech have already collaborated on a ventilated photovoltaic glass facade for buildings that is already in use around the world. 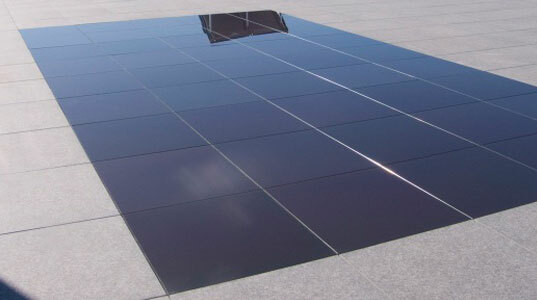 The companies are hoping to that their new photovoltaic paving stones will hit the market by the end of this year, however, not much information on its specifics are available. They won’t let on to how much energy the tiles will generate, how they are constructed, or how much they will cost. Believe this is the future. 100 years on, this should be norm and people be blase' about it. So, are they available for purchase yet? Last year is truly over. So where are they, and where are the specs? wow how goods this? what huge potential. With the depletion of natural recourses ,this is a wonderful solution. I would like to use this in our office flooring and use the power generated for office lightning Can you suggest? I would like to know more and get in on updates. Please tell us about the efficiency of these panels, and if you have any advice about the backup battery building, what if the battery arrays fall because of an earthquake? Do you have a list of battery families from the least to the most dangerous? I guess it is safer to use these panels in large ceilings and to keep the battery building separated from the main building. we want to build a solar building. so please provide all information about the suitable product for our project. Interesting, but what's the efficiency on these bad boys? Also, how much heat do they retain??? NOT IN MY BACK YARD (patio). 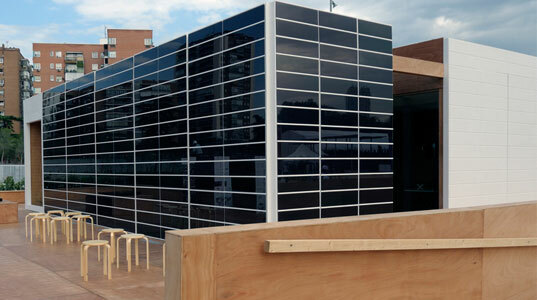 Onyx and Butech's photovoltaic glass panels for buildings are already in use.